Researchers at the Harvard John A. Paulson School of Engineering and Applied Sciences (SEAS) have developed a flat optical component that is simultaneously a metalens, a microscope objective that can resolve details smaller than a wavelength of light, and an optical vortex and hologram generator. Each functionality is controlled by a different wavelength of light. "The breakthrough of this new flat optical device is that it can radically change its function based on the wavelength of light it reflects," said Federico Capasso, the Robert Wallace Professor of Applied Physics at SEAS and senior author of the research. "By tying functionality to wavelength, we have opened up a whole range of new possibilities for metasurfaces." The research was published in Nano Letters. "In this research, we decoupled functions at different wavelengths," said Zhujun Shi, first author of the paper and graduate student at SEAS. "Compared to previous flat optical devices, this device has an extra degree of freedom that you can tune at different wavelengths. For example, at one color, this lens behaves like a traditional metalens but at another wavelength, it generates a vortex beam." The lens builds on previous technology developed in the Capasso Lab, which used different polarized light to change the function of a lens. But since there are only two forms of circularly polarized light — clockwise or counterclockwise — the researchers could embed only two different functions in the metasurface. "By controlling the device function with wavelength, rather than polarization that is bound to two states, we have dramatically increased the information capacity of the lens," said Mohammadreza Khorasaninejad, co-first author of the paper and former postdoctoral fellow in the Capasso Lab. 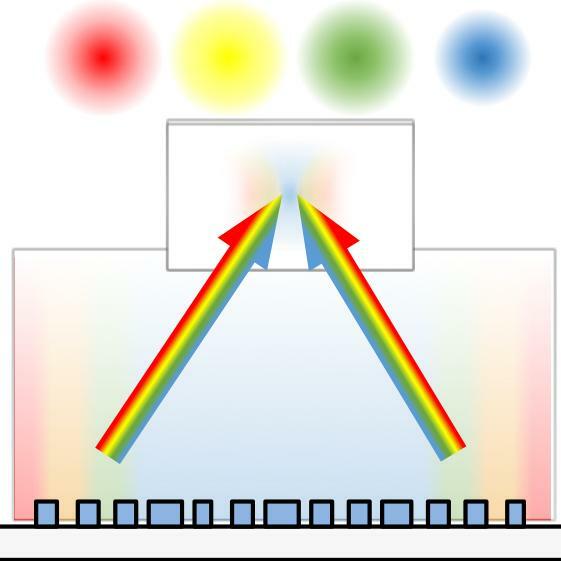 "With this technology, we demonstrated an achromatic metalens in blue, green, yellow and red wavelengths, two beam generators, and a full-color hologram." While this is not the first lens to tie function to wavelength, it is the most efficient. Previous wavelength-dependent metalenses encoded different functions in different areas of the surface; for example, red light would be focused in one quadrant and blue light in another. With this technology, Shi and the rest of the team engineered the individual nanoscale optical elements to embed functionality at the local level, across the entire lens. "By encoding everything locally, in a single layer, we improved efficiency from 8 percent demonstrated in previous wavelength-dependent metasurfaces to more than 30 percent," said Yao-Wei Huang, co-first author of the paper and postdoctoral fellow at SEAS. Next, the team aims to improve that efficiency even further and develop a transmitting, rather than a reflective lens. This research was co-authored by Charles Roques-Carmes, Alexander Y. Zhu, Wei Ting Chen, Vyshakh Sanjeev, ZhaoWei Ding, Michele Tamagnone, Kundan Chaudhary, Robert C. Devlin, and Cheng-Wei Qiu. It was supported in part by the Air Force Office of Scientific Research.